Meet new friends or bring one with you! Come enjoy our Fun Painting Class with Ilya. Looking for something creative and exciting to do with friends? Artistic Edge is having a Adult Paint Class. You’ll be surprised at your inner artist as you recreate a step-by step masterpiece and in the process you will have FUN! Remember, absolutely no experience is needed our instructor will help you every step of the way! 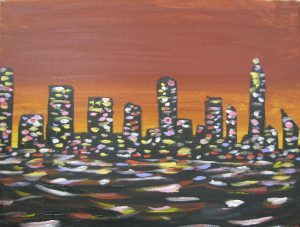 You may paint a city scape or anything you like – Ilya will help you with layers and brush work. We require a minimum of 8 painters, but can accommodate 12. To confirm your spot please call us at 916-482-2787 or email atartistic.edge@hotmail.com. Saturday November 4th from 6:00-8:30 p.m.
at Artistic Edge Gallery, 1880 Fulton Ave.
All sales are final, no refunds, no exchanges, no make-ups will be available. This is a 2.5 hour class and the cost is $35/each for cash or $39/each with Credit Card.